We appreciate you making us aware of your concerns. It is our understanding that we have completed your installation. If you have further questions or concerns, please contact us at customersupport@empiretoday.com. Had engineered hard floors installed; installers very pleasant but rushed through the job, and left lots of things either undone or damaged - like sheetrock for example. I now have to work on cleaning up their mistakes and damage. Not sure if they fully understand how to install flooring since I was providing most of the direction on what needed to be done. I realize that this experience is not unique but will not use them ever again and will not recommend them to anyone. Reason of review: poor quality during installation. I liked: People were very courteous. Review #747506 is a subjective opinion of User747506. We never want our customers to be disappointed in the work that’s done in their homes, and we would like to know more about the issues you’ve been experiencing. 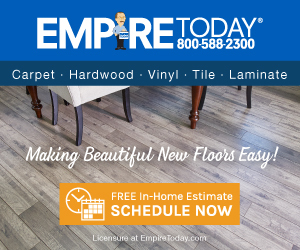 Please send your contact information to customersupport@empiretoday.com so that we can follow up with you, learn more about what happened, and work towards a resolution. Thank you.